Back in January 2016 I wrote a post lampooning all the wars being waged on the likes of drugs, terror, science, women, football, Christmas and even noisy leaf blowers. To that list I added the Myers Briggs Type Indicator (MBTI) and what I considered mostly baseless claims by people who don’t understand, or more likely want to gain attention, by criticizing the MBTI. One, the cover refers to “smoke-filled board rooms” where corporate villainy was plotted and executed. In the book itself, I could find no reference to that colorful image. The MBTI was first published by ETS, best known for the SAT. From ETS it went to CPP or Consulting Psychologist Press. Neither publisher is known for shady deals or “smoke-filled board rooms.” Frankly, it is hard to understand what the author is writing about. Two, the author claims that the MBTI community insists that people don’t change, that their personalities are set in stone. While Jungian theory holds that preferences are natural, responsible use of the MBTI emphasizes that we all use all of the preferences all of the time. Further, “type dynamics” explains how we focus on different preferences as we mature. The emphasis is on “dynamic”, not “fixed” and never evolving. It is important to underscore that ethical use of the MBTI includes a verification dialogue which invites the client to choose the best fit preferences. This process does not rely on indicator results alone. But, the MBTI manual goes beyond that providing numerous studies supporting both the validity and reliability of the MBTI. Before we leave the topic of validity, I would be remiss if I did not address another common criticism of the MBTI: that it does not predict career performance. This would be like criticizing voice recognition software for not accurately predicting the weather. It never intended to. The MBTI manual and responsible users are very clear in emphasizing that the MBTI was not meant to be used for personnel selection. After reading to this point, you would likely conclude that I would not recommend ordering Personality Brokers. Despite the author’s obvious bias (I mean the title is a give-away), the treatment of the dynamics among and between Katherine Briggs her daughter Isabel Myers and Carl Jung is fascinating. Indeed, Katherine had an over-the-top adoration of Jung. It would not be much of a stretch to substitute stronger words here like unhealthy obsession. Isabel, once a best-selling author (Murder Yet to Come, 1930), became frustrated with her own career accomplishments and picked-up the MBTI baton once her Mom was unable to advance the assessment further due to failing health. 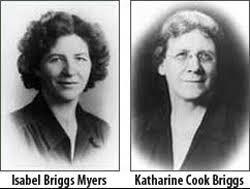 Emre writes that as a woman writer she wanted to credit the accomplishments of Briggs and Myers. Here is an insight that may have helped. Psychology was in its infancy when Katherine, to be kind, was a proactive mother. Critics, including her hero Jung, faulted her for practicing psychotherapy without professional training. What Emre fails to note is that the pioneers of psychology she writes about like Freud, Jung and Henry Murray were all medical doctors. There were no masters level professionals licensed by the state to do counseling. How many wives and mothers in the eras of Katherine and Isabel had medical degrees? Sure, the MBTI, like all assessments, is best understood as a tool and the results of its use are dependent upon the craftsmanship of the user. Clearly though, without the dedication of Katherine and Isabel, eccentricities and all, there would be no MBTI and millions of people would not have benefited from being introduced to the genius of Carl Jung.